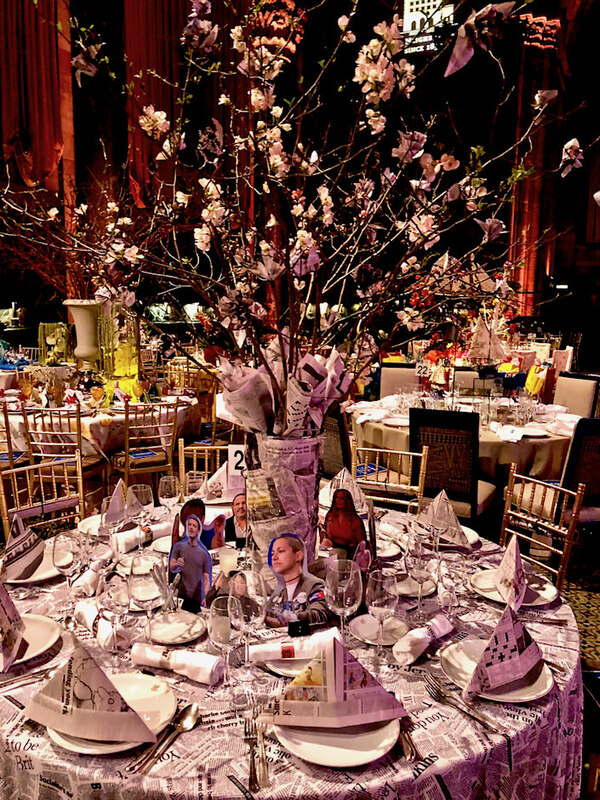 It’s that time of year, and even though the weather hasn’t been particularly springlike, we are having the usual spate of seasonal design events. 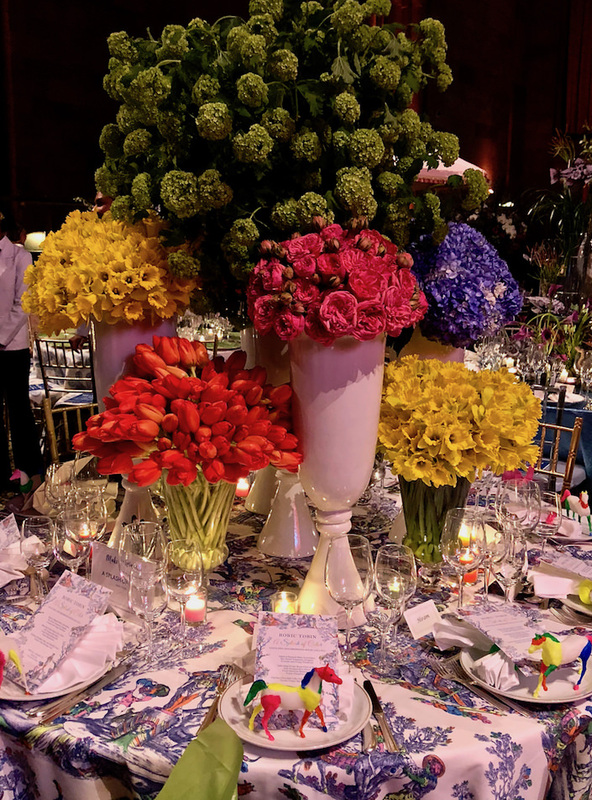 Monday evening was the wonderful Kips Bay Boys & Girls Club Presidents Dinner, honoring NYC’s five interior design education institutions and the lifetime achievement award going to David Easton. Stay tuned for sneak peeks of the showhouse at the end of next week! And then this week has also been tabletop market – those who follow along on Instagram got a glimpse – full post coming soon. 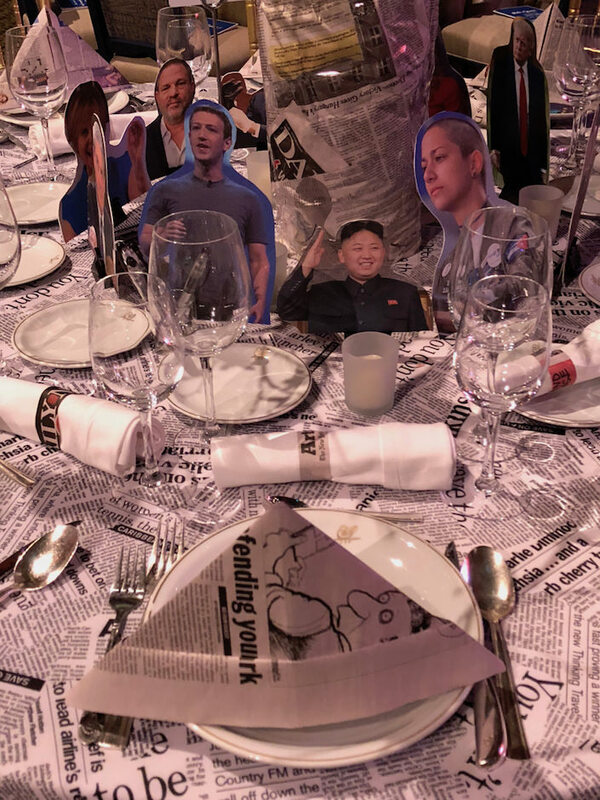 And then last night was the 2018 Lenox Hill Neighborhood House Gala. 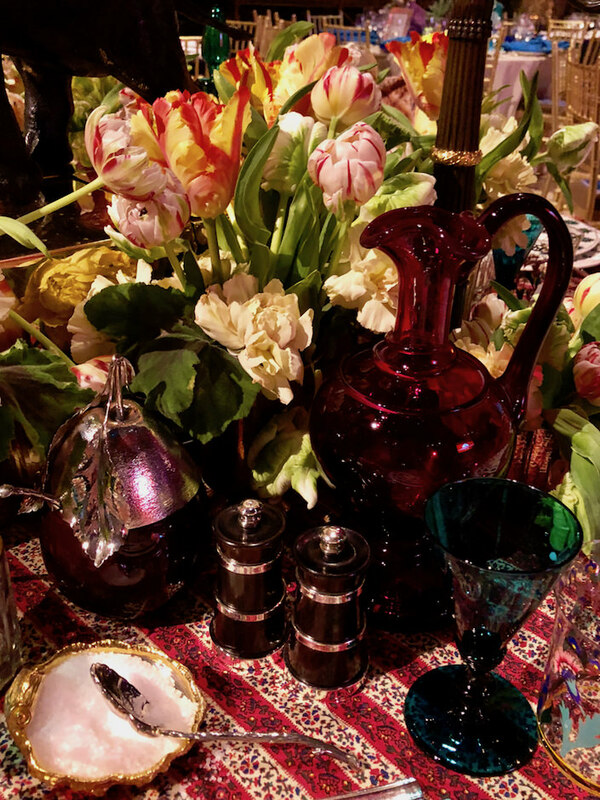 Always a favorite event of the season, this year the gala honored Sana Sabbagh for her outstanding leadership and support. 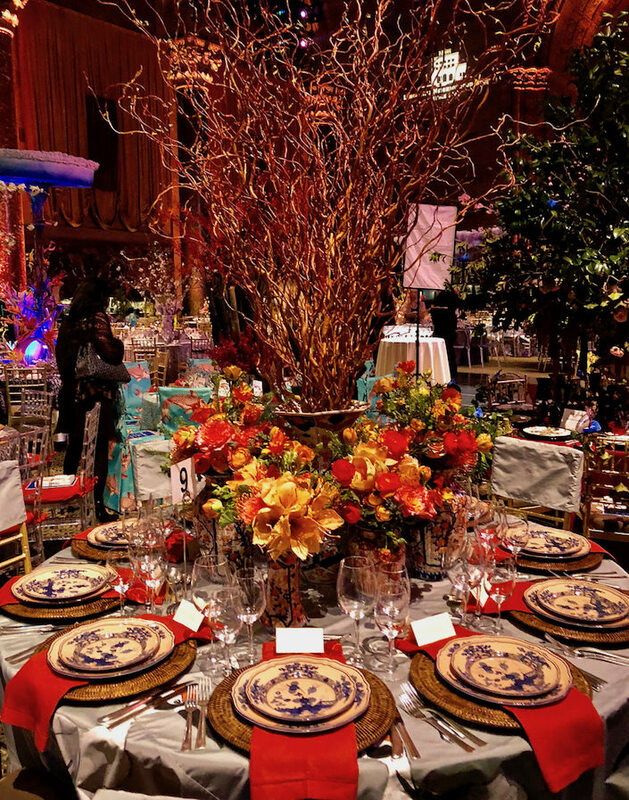 In addition to, most importantly, raising funds for this worthy organization, the spectacular tables offer an abundance of inspiration for spring entertaining. 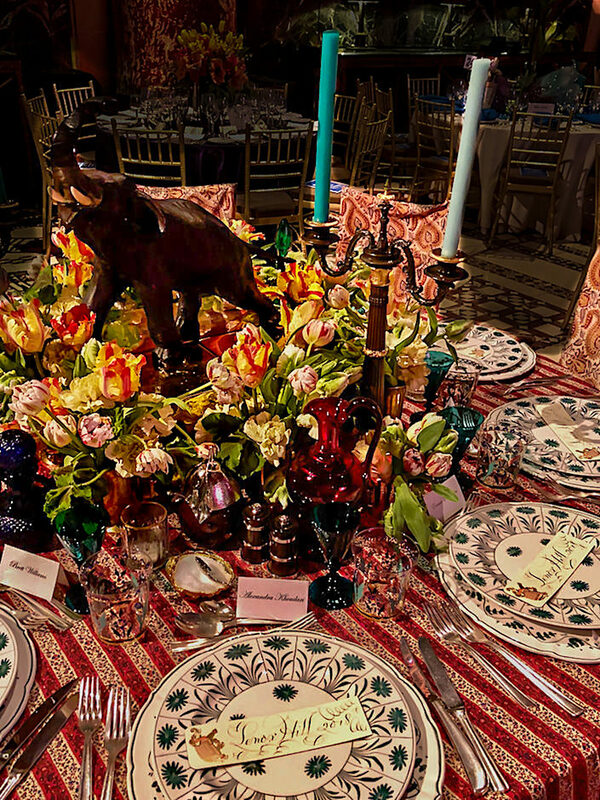 Above, and below, designer Virginia Tupker created a layered bohemian table with a lush maximalist vibe. 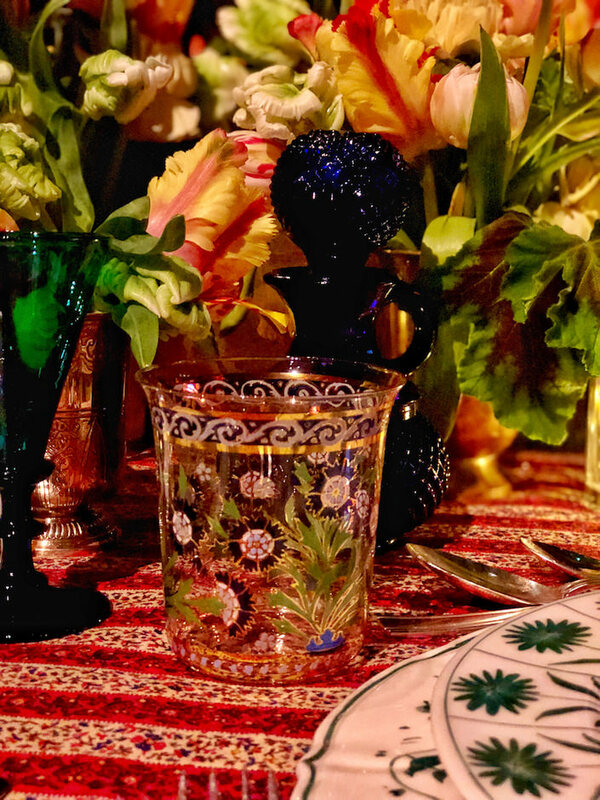 With an arrangement from Emily Thompson worthy of a Dutch still life, Virginia layered a tablecloth of Soane’s new Qajar Stripe, with les Indiennes napkins, and plates from Paravicini. The charming hand calligraphed Bernard Maisner book marks were guest gifts. highlighting a selection of those who have made a splash in the headlines. 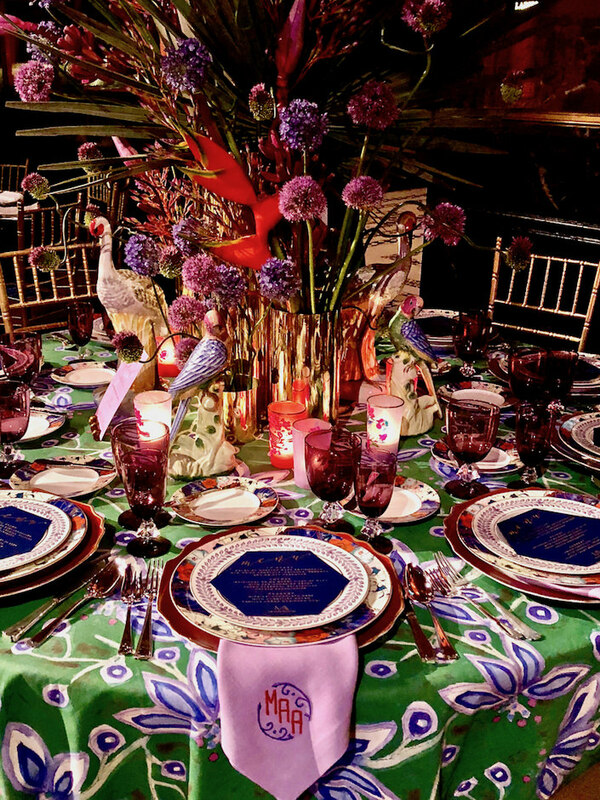 Designer Roric Tobin made a splash with color at his vibrant table. 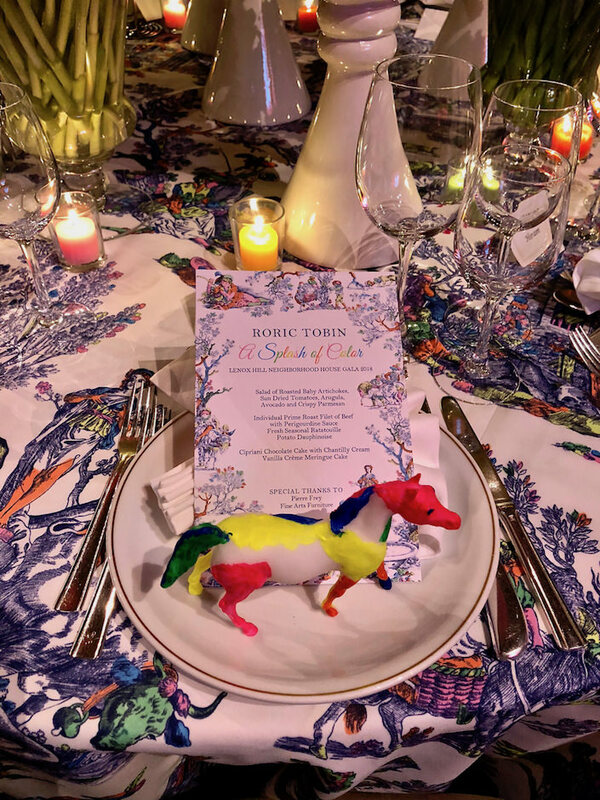 Anchoring his table with a tablecloth of Pierre Frey’s les Buveurs Fluo (a classic toile updated by Mat & Jewski with fluorescent colors), Tobin harnessed the power of one in his dynamic centerpiece of masses of neon colored blooms. Horses of a different (bright) color finished the scene. 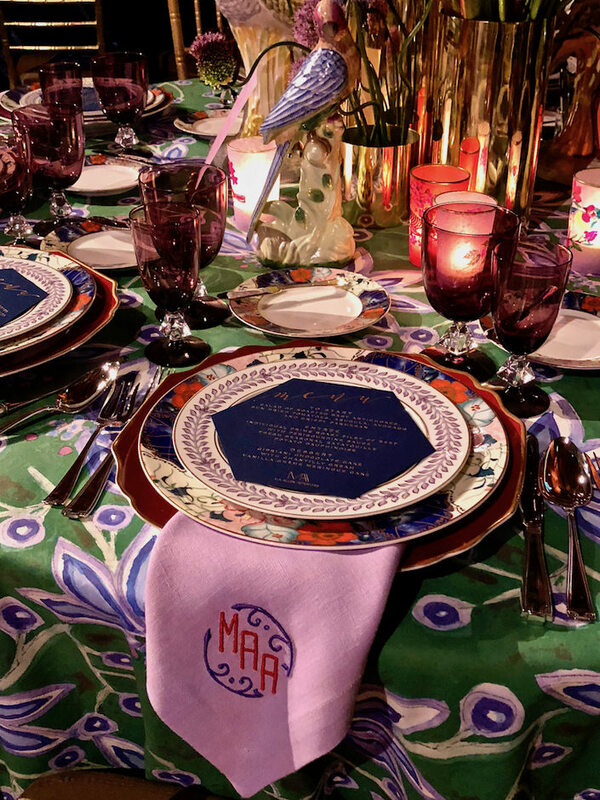 North Caroline based MA Allen wanted to showcase other southern creatives with a table brimming with color and pattern. 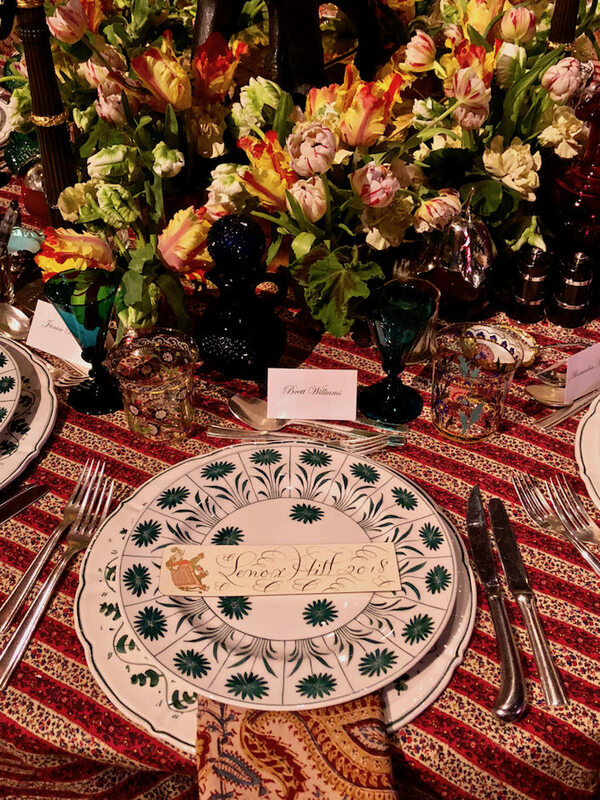 On a tablecloth of Ferrick Mason‘s Melodye, she included tableware from sponsor Replacements, Ltd – Versace for Rosenthal salad plates with dinner and bread plates in Raynaud’s Jardin de Printemps, Gotham sterling and Aquarius Amethyst crystal from Bryce. Beautiful custom monogrammed napkins from Leontine Linens added an elegant pop, enchoing the fabric and centerpiece by Metaflora. 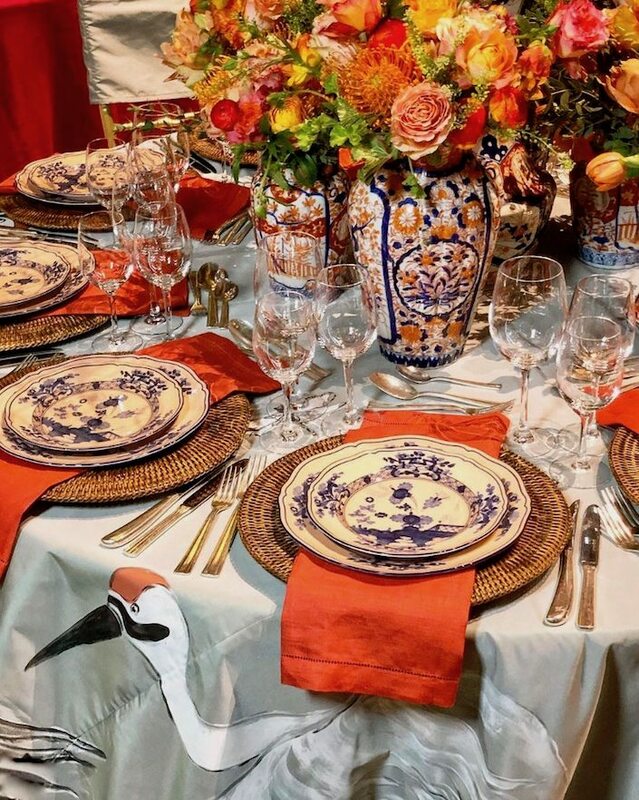 Timeless antiques and china were updated with a fresh color scheme on Jared Hughes‘s lovely table. 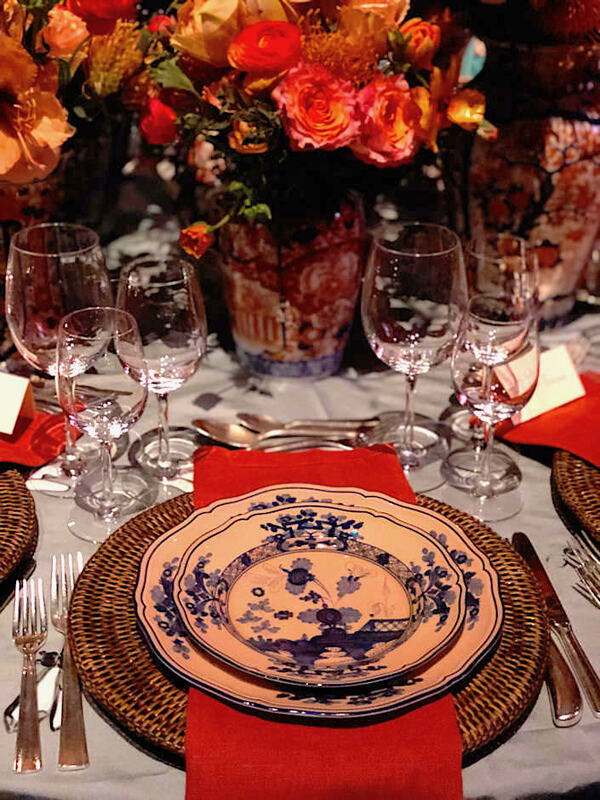 beautiful Ginori Oriente Italiano china and stunning large antique Imari vases from William Word. 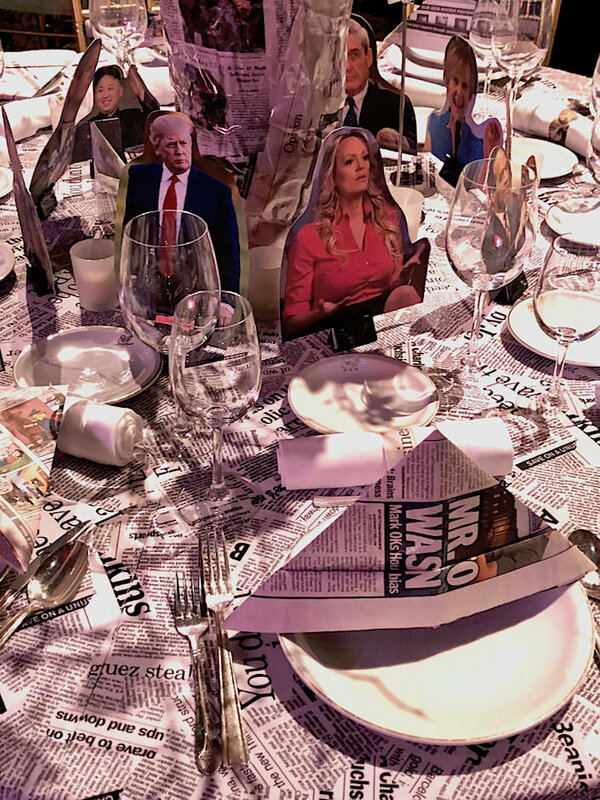 Stop back next time for more from the 2018 Lenox Hill Neighborhood House gala. This entry posted in interior design. 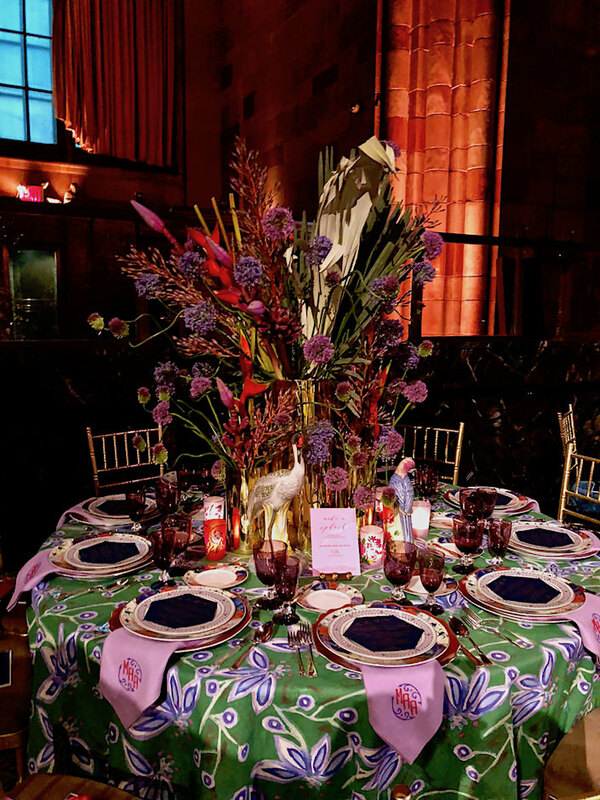 Entry Tags: Lenox Hill gala, Lenox Hill Neighborhood House Gala, Tabletop Bookmark the permalink. What a wonderful post! Please keep blogging! Dropping like flies! Mine included! I will post soon! Just came out from under 75 tons of mud! I love tabletop! My motto: a new meal, a new table. I try not to set the exact same table twice. And I try to set the table for every meal, feast or nibble. It just represents all the things I cherish most about living; food, family, conversation. To embellish the table upon which we dine, is a metaphor no? Make each thing special. Savor. Relish. Enjoy. Thanks Stacey for capturing these stunning settings. And Virginia must be complimented. What a glorious table. I would never want to leave! Those tumblers with that cloth!!!!! Also, very happy to see that Replacements lent the Gorham silver in the Etruscan pattern to MA Allen’s table. Not incredibly popular among antique enthusiasts, it is breathtakingly beautiful with chinoiserie when monogrammed! Speaking of monogrammed. Can Jane do anything wrong? Ever? Flawless embroidery to make the heart sing. Wonder if her designs could be engraved onto flatware? Gorham Etruscan engraved with Leontine’s Patricia monogram? I am starting a petition to send to Jane. Who wants to sign it? how much they love them….everything quick and easy. A brilliantly illustrated post … Thank you!! 80 queries in 0.872 seconds.